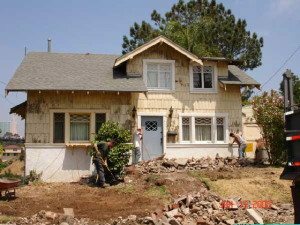 After doing over ​3​0​ to 35​ foundation repairs a year in San Diego, California, we can tell you exactly why these foundation failures, cracks, and issues occurred. It usually comes down to improper ​roof and surface drainage on expansive soils and poor surface grade around the home. Most homes in San Diego county are built on expansive soil. The worst thing you can do if your home is on this type of soil is to let water ​stand or pond next to the house ​ without proper drainage away from the home or an area drain system. All homes should have an eave gutter downspout system connected to a below grade SDR35, non-perforated pipe system discharging to the street or other legal water coarse. Expansive soil​s​ are a recipe for foundation failure, cracks and other damage when you ​have poor surface drainage. ​ When water does not drain away from a home on a slab foundation or a raised foundation​ with 18 inch crawl space the home is subject to soils movements resulting in foundation settlement or heaving. 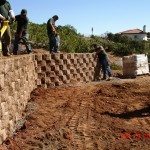 San Diego gets enough rain (especially in the flash flood prone years – once every​ 8 to​ 13 years) to put your home foundation in jeopardy if you don’t have proper drainage in place. By the way 2015 is a​ heavy rain fall​ prone year. Take a look at the perimeter of ​your​ home. Notice if the surrounding land slopes toward your home or away from your house. Then notice for what distance it does slope before it changes direction. If you don’t see a clear slope down and away from the home, check out the following tips to learn more about proper drainage for the prevention of foundation ​subsidence and cracking​. All surface grading at the house should be 6 inches or lower than the top of the interior concrete slab​ or wood framing​ and should drain away from the house at 1/4 inch per foot fall for a minimum of 5 feet. At this point the grade should drain to the street or other legal water course. If this is not possible due to existing grades and improvements, then install 6″ diameter or square area drains connected to a 4″ diameter​, SDR35,​ non-perforated pipe system discharging at the street or other legal water course. In addition, connect all your eave gutter downspouts to this system. Install roof gutters that are hung level, tight to the roofing material with one downspout for every 20 linear feet of gutter. Each downspout should have an attached tight line pipe discharging all roof waters at a minimum of 10 feet from the house or onto a hardscape or other proper drainage channel. All irrigation valves should be a minimum distance of 10 feet from the house plumbed from house to irrigation valves with 3/4 inch​, “L” grade​ copper pipe. Doing the proper drainage work now can prevent a wide range of problems from landslide issues to cracked foundations and other headaches due to excessive repairs that will be required if you don’t take care of your home now. 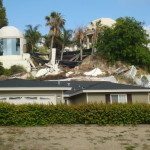 If you believe you have foundation or landslide trouble now, we can help and will work to provide a solution to repair and protect your foundation and land from here on out.